Mike Lewis II is coming home. With the announcement coming almost out of the blue, the St. Louis native and former Duquesne guard has committed to Saint Louis University for his senior year. After spending last semester sitting out at Nevada, the exact nature of Lewis’ eligibility is in still uncertain, but the 6’1 guard will give the Billikens a dynamic three-point threat. 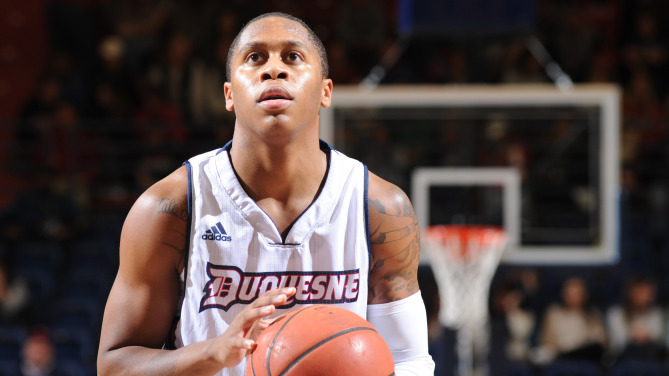 At Duquesne, Lewis was a starter his first two years and averaged 14 points a game both seasons. His sophomore year, Lewis shot 37 percent from three while attempting 7.6 three pointers per game. Lewis then saw his minutes get drastically cut as Keith Dambrot got more of his guys at Duquesne and elected to transfer to Nevada, where he sat out last semester. After Nevada coach Eric Musselman left for Arkansas, Lewis put his name in the transfer portal. Due to his time in Nevada, it is unlikely that Lewis will have to sit the two years that A-10 players transferring to another A-10 school typically would. However, it is still unclear at this point whether Lewis will be eligible first or second semester next season. SLU has not had a proven volume shooter like Lewis in a very long time. Lewis is extremely comfortable playing off ball, with 82% of his made threes last season coming off assists. In Lewis, Jordan Goodwin and incoming freshman Yuri Collins will have a very willing recipient of their dimes. With Lewis, Gibson Jimerson, and JUCO transfer Javonte Perkins coming in, it’s clear that Travis Ford is trying to shore up the Billikens’ shooting. In many ways, Lewis coming to SLU is a righting of wrongs. Jim Crews did not recruit Lewis or offer him a scholarship out of high school despite seeing lots of Lewis at Chaminade, where he was teammates with Jayson Tatum and Tyler Cook. Since taking over, Ford has taken advantage of St. Louis’ fertile recruiting ground. Lewis is the fourth member of the 2019 recruiting class who is a St. Louis native, alongside Yuri Collins, Terrence Hargrove Jr. and Javonte Perkins. Countless SLU fans over the last three years have said things like, “Man I wish we recruited that guy,” or “He really would have looked good in Billiken blue” about Mike Lewis II. I never thought it would be possible, but now we get to see it actually happen. Travis Ford continues to surprise with his recruiting. Pretty wild what has happened to him – coach leaves Duquesne, transfers to Nevada, coach leaves before he even gets to play. Hope he’s immediately eligible. I’m not too surprised he left Nevada given Musselman took off. I’m more surprised he committed to Nevada in the first place… I think it was pretty obvious Nevada was going to go through a huge transition with a ton of seniors graduating (I think they were the 2nd most experienced team in the country), and Musselman was kind of bound to jump on any Power 6 opportunity out there. Glad Lewis is coming back to the A-10! SLU seems like a good spot.